If the abandoned, cavernous wasteland in your local mall that used to be a Barnes & Noble is any indication, no one reads books any more. A lot of people look at them as a waste of paper and ink. But the Drinkable Book is neither. Created as collaboration between scientists from the University of Virginia, Carnegie Melon and the non-profit Water is Life, it is both a manual on how to get clean water and a tool to make it. According to the most recent report from the UN 783 million people don’t have access to clean water and 3.4 million die from a water-related illness. Water is Life has been working since 2011 to bring that number down by providing creative filtration methods like the Life Straw (a brilliant little invention that actually filters water as you drink it) to some countries in dire need of drinkable water. 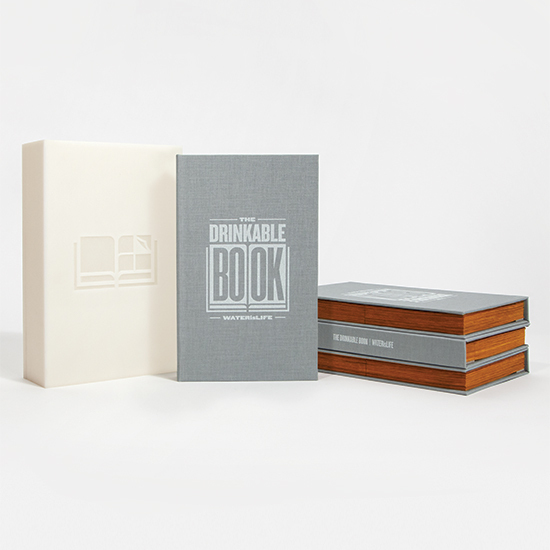 The drinkable book is their latest work and they plan to begin distributing it in 2015. Coated in silver nanoparticles that kill diseases like cholera, E. coli and typhoid, each page of the book is made from a special filter paper that its creators say eliminate more than 99.9 percent of bacteria in contaminated water making it comparable to tap water in America. It could be a game changer around the world as each page can provide 30 days of clean water, which means that each book can provide an individual with enough clean water to last four years. Pretty impressive for a single tome.